Sunglasses aren’t just mere fashion accessories, rather absolute essentials whenever you’re stepping out in the sun. But why go for the boring ones, when you can play around with so many different shapes and sizes. From retro round glasses to the quirky brow-bars, we found 6 kinds of shades on FC Road, starting as low as INR 160. We spotted this very chic, very cool royal-blue-frame John Lenon vintage sunglasses with octagon gold double rims for INR 200. You can get these from the roadside store opposite Goodluck Cafe that also has a wide collection of aviators, wayfarers and more. From Kylie Jenner to Selena Gomez, almost all fashionistas we know rocked the brow-bar shade this summer. While you can get brow-bar on aviators, cat-eye and various other geometric shapes, we found ours on retro round frames. Priced at INR 170, get this pair from the shop opposite Cream California, beside Flavours. 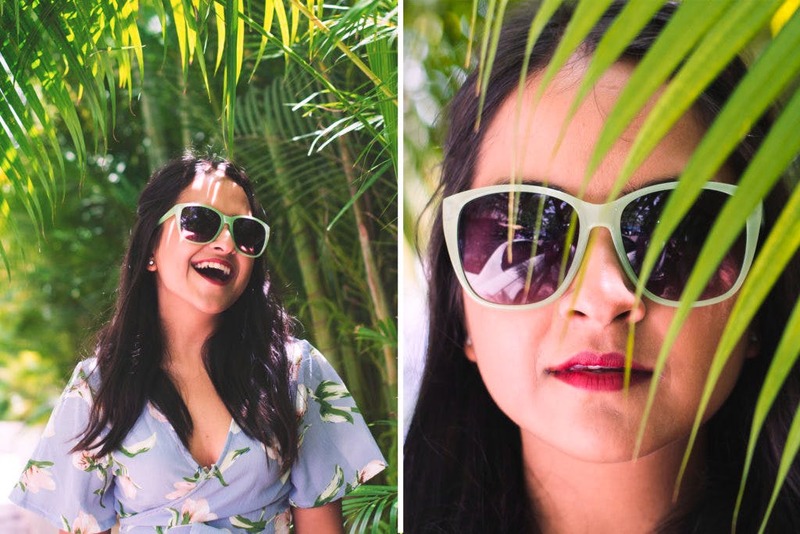 Bug eye shades are fun, quirky and really protects your eyes from the harsh sun-rays. We picked our white-rim bug eye for INR 200 from a vendor near Roopali. You can also check out varieties in floral prints, simple browns and more. Sleek and sophisticated cat-eye sunglasses are undoubtedly the biggest and the hottest trend of the season. The silhouette is versatile and pairs quite well with formals, casuals, even your athleisure clothing. We got two pairs for ourselves; one in classic black and the other with a pretty sea-green rim for INR 200 each. Pretty good deal, right? Aviators are perfect for all kinds of face shape – from square to diamond and oval. Besides, aviators are all-time favourites, aren’t they? We found these tinted brown aviators with cute butterflies on the side for just INR 220. Black wayfarers have been a hot favourite for very many celebs including Taylor Swift, Anne Hathaway and Robert Pattinson. So, why not follow the trend and add one to our wardrobe too? We got these great wayfarers for INR 160 from a tiny store right beside W on FC Road.